The American amateur was Cornelius Tangeman. His artistic friend and mentor was Artur Halmi. Some years later - in 1910, to be exact - ­Halmi visited the United States for the first time. Talent and experience he brought with him, but not his European reputation. He had to search about for somebody who knew him, and whom he knew. Provi­dentially, he found Tange­man. At their cordial re­union in the latter's office, the artist's susceptible eye was caught by the photo­graph of a lady on his friend's desk. "Who is she? " he in­quired eager­ly. "Ah, if I could only make a life­ study of that face!" "She is my wife," an­swered Tange­man, "and your first commission in America shall be to paint her portrait." Hahni did, con amore, the full-length, lifesize oil portrait of Mrs. Cornelius Tangeman, which immediately won a success of appreciation comparable to that enjoyed by the fair original herself. Beauty attracts beauty, and nothing succeeds like success. Commissions began shyly to come, then to crowd in, from the Tangemans' friends and the friends of their friends; which meant that first-class social patronage, the more important half of the fashionable artist's game, had been magic­ally won with the first few brush strokes. Then there was the portrait of President Taft, for the Hungarian Club. No beauty, this, but a fine, manly piece of character painting. This bit of work accomplished for Halmi's artistic standing, at his first exhibition two years ago, what the virile "Colonel William Jay" and the bluff old "Dr. Horn" did at his second show, last December. It showed that the hand which idealized pretty women in pastel could, with even greater gusto, hit off strong men, boldly and broadly, in the genuine man painter's medium, which is oils. 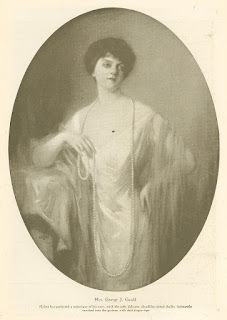 Halmi's pastels, how­ever - and these include the adorable presentments of Mrs. George Gould and her four daugh­ters, Mrs. Joseph Du­veen and Miss Dorothy Duveen, Mrs. William Ran­dolph Hearst, Mrs. Shevlin, of Minneapolis, and the Guggenheim and Rainey children - are in a class by them­selves, and a distinctly high class at that. In these unique and exquisite works, the artist has perfected a technique of his own, primarily for the sake of the rapidity and freedom of execution gained, but also having in mind the fleeting) evanescent shades of expression and color which con­stitute the essence of individuality in a sensitive sitter, and which are best caught by means of the soft, delicate, cloudlike tinted chalks, intimately touched into the picture with deft finger­tips, no harsh brush or pencil intervening. To see Halmi in action with his pastels is a lively sensation. "There! That's what I want! Let me get it, just as you are now." Having dashed in a few guiding lines with crayon, he reaches out over what may be called a vast keyboard of hundreds of pastel stumps strewn on a tray by his side, and with marvelous swiftness picks out note after note of his color-gamut, with the unerring ease of a Paderewski impro­vising at the pianoforte. In an incredibly short time, it lifelike face and figure blos­som out on the canvas; while the artist himself, smeared and disheveled in his en­thusiasm, looks like an Indian in war-paint. Frequently he has completed a large, full ­length picture in three or four sittings. "Clever, but superficial," is the obvious criticism. The artist admits as much, and even apologizes for it. Yet, it is the only practicable thing to do under the circum­stances. The imperious beauties who have crowned Halmi their painter laureate will have nothing else. He might even claim, with some justice on his side, that pretti­ness and superficiality are in many cases the most characteristic traits, therefore the psychological truth, of his subjects. "After all," a flatterer said to him," your method is essentia1ly that of Sargent." "Oh, no," protested Halmi earnestly; "you can't compare me with Sargent, for two reasons - and one is sufficient: I am not a great artist, and he is. Secondly, he is absolutely independent in his portrait painting, while I am just the re­verse. What I mean is, I can't help striving to please and to express beauty. Some say that is too easy with the patronage I have and;. in a sense, it is true. At the same time, as occasionally happens, when I paint artificial complexions and Paris gowns, and discreetly overlook double chins, and draw figures mostly in imaginary lines, I am thinking of my sitter rather than of myself and of my art. That is not so easy, I assure you. the excuse I then make. 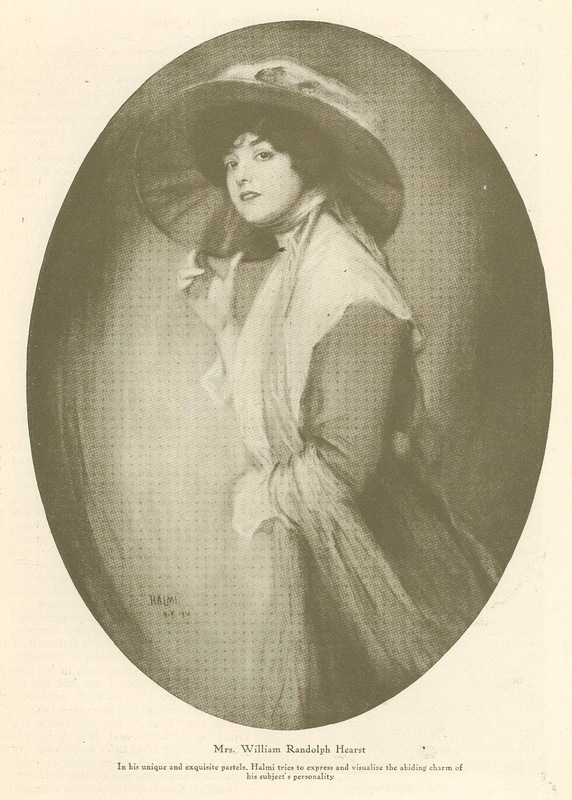 to my conscience is, that, in portraying a lady reputed beautiful, it is not my business to paint her just as I happen to see her at the moment, but rather to try to express and visualize the abiding charm of her person­ality at its best. Besides, people are beginning to insist, in these days, that a portrait, like any other pic­ture, must be intrinsically in­teresting and have a distinct decorative value, indepen­dently of its merits as a likeness." Spoken like a gallant pupil of Makart and Munkacsy! And such, indeed, is Artur Louis Halmi's status. Born at Buda­pest in 1866, and graduated from high school in preparation for the Polytechnic College, young Halmi elected to enter the Conservatory of Music. "He developed such distinct talent as a violinist that when he went to Vienna, in 1883, it was with the avowed purpose of entering the famous Academy of Music there. But, meanwhile, he had taken up drawing, at first as a pastime, then for a while as a regular pupil in a drawing class in Budapest. His friends, when the oppor­tunity came, prevailed upon him to consult Hans Makart, then at the height of his popu­larity as a courtier-painter. Makart was sufficiently impressed to propose taking the young man as an artistic protege; but the gifted and genial master's early death prevented the realization of this plan. Halmi then entered the Vienna Maler Akademie. In 1886 he went to Munich. This was a propitious move; for one year later, before the youthful artist had fairly come of age, he painted his first full fledged original picture, a genre piece entitled "After the Examination." It de­picted the large anteroom of a school, flooded with sunlight, where the parents of the girl pupils have come to congratulate or to console them upon the results of their examination. This brilliant little canvas achieved an immediate and astounding success. It won the Munkacsy Prize of six thousand francs,. including a Paris scholarship, and was purchased , by the govern­ment for the National Hun­garian Museum at Budapest. Under. the inspiring influence of Mun­kacsy and Paris, Halmi followed up his lucky stroke in the genre line with a series that included the little gem called "The Piano Lesson," and a more ambitious work known as "The Secret Marriage," subsequently bought by the Emperor Francis Joseph. 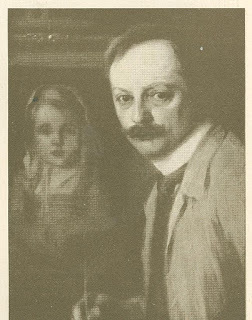 In the intervals of his genre painting ­which, during the years of 1887-94, brought him such considerable honors as the Grand Gold Medal, at Ant­werp, the Millennium Medal, at Budapest, and a medal with honorable mention, at the Paris Salon - Halmi busied himself more or less with illustration, and per­sistently with portrait painting. This latter branch of his art took him back to Budapest, in 1894, with a number of commissions. Here he met that modern Maecenas, Count Esterhazy, who invited him to his castle, which, at that time, was in its full glory as the rendez­vous of artists, dilettante, mu­sicians, and men of letters. Halmi went for a weekend, and stayed over a year, painting everything and everybody in sight, in his joyous, improvisatore fashion. But this strenuous life of artistic gaiety finally palled, and the impressionable painter fled to Munich, where, for two years more, he was congenially occupied in helping to make Jugend famous. Jugend did as much for him, and he was called to Vienna for a monumental commission. This commission was to pro­vide the illustrations for the sumptuous memorial volume is­sued to celebrate the Emperor Francis Joseph's golden jubilee; and Halmi acquitted himself val­iantly of the tremendous task of making, in a few months' time, over three hundred portrait studies, all from life. After this tour de force he went to Berlin, and entered upon an eight years' career as semiofficial court painter, which gained him permanent recognition among the leading contemporaneous portrait painters of Europe. Returning, in 1906, to his na­tive Budapest, with no other intent than a brief holiday, he dashed off a wonderful bravura portrait of a Hungarian beauty, which created such a furor that he had to remain there three years. This experience is now repeating itself, on a more magnificent scale, in New York. Originally published in Cosmopolitan Magazine. April 1914.